About a week ago, I got mail from one of our Flickr buddies, Mark (flickr: KingDufus). He asked me if I wouldn’t mind some company on one of my peregrine watching trips. I told him I would LOVE an extra pair of eyes and we arranged to meet this weekend, if the weather cooperated. Yesterday was rainy, but today, Sean and I woke to a crisp and beautiful spring morning. By 9am, we’d rendezvoused with Mark and the three of us made our way to the garage top. I explained our plan for the day. We’d spend some time at the garage top in the hopes of seeing Hercules and/or Max. This would provide Mark with the opportunity to see a peregrine in context, as he’d only ever seen peregrines in my pictures. 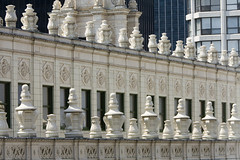 Then, we would begin to work our way up to Wacker and Michigan. Our goal – find the river birds. When we got to the garage top, I pointed a number of feathery masses, mostly on top of the garage stairwell’s roof, and explained some things about Hercules and Max, who were nowhere to be seen. For the next hour and a half, the three of us chatted and watched known perching areas. At one point, I saw the streak of a peregrine stooping after prey on Plymouth, two streets to the east, but it disappeared behind the buildings. This time of the year can be difficult for viewing peregrines. One of the adult pair is occupied, brooding the eggs. At the MCC, that means that adult is well out of sight. The other adult returns to the nest only to bring the brooding adult food or to switch places. So, you are down to one adult in the skies and few trips to the nest. After an hour and a half of nothing, I left the boys on the roof and made a quick trip down to the western side of the MCC. No one was on the ledges, but I finally spotted an adult perching way up on the southwestern corner of the CNA Insurance building. Realizing that it might not come down for hours, I went back up to the garage top to collect the guys. We made our way up Michigan Avenue, stopping here and there to take a look around for peregrines. 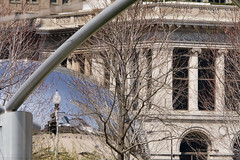 When we got to Millennium Park, we stopped to set up the scope. After about a half hour, we still hadn’t seen any activity. About a year ago, Sean and I went for a Sunday walk up to the small bird sanctuary to the north of Navy Pier. I could SWEAR that we passed a huge sign advertising an observation deck on the Aon Tower that day. I’d planned to go up to that observation deck to get a nice, long look at the River Bird’s territory, but when we got there, the security guard informed us that no observation deck existed. Weird. So, Plan B. Sean took us up to a vacant floor in the Trib Tower, about the 17th. It gave us a commanding view of the Michigan Avenue bridge and surroundings, so we got our gear out and started scanning the area. It didn’t take long before I spotted a peregrine coming up the river from the west. It landed kitty-corner to us on the London Insurance Building! I excitedly pointed it out to the boys. 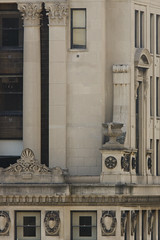 The peregrine stood on a small railing between a giant stone urn decorating the northwestern corner of the building and a lion-headed decoration a bit further towards the center. Before Sean and Mark could spot the bird, it hopped off the railing onto what I supposed was a small “balcony” type deal and was out of site. It didn’t take long before another peregrine swooped into the area. It circled the area over the bridge, at one point passing right by our window. I saw the glint of leg bands, but no more than that. For the next hour, we watched as it landed on the Wrigley Building, the building to the east of London Insurance and on London Insurance itself. The other bird stayed down in the nest. Sean got plenty of pictures and I passed some high-fives around. River Birds FOUND! Way to go, team! After lunch and a lazy walk back home, we bit goodbye to Mark. It really seemed like he had a great time, even though he didn’t have any close views of the magnificent birds. I hope that he’ll join us again, later in the season, when viewing will be a bit more active! ~ by Steph on April 20, 2008.